Jerry MiJilton of Jaimoe Knives grew up in Northern Wisconsin where he fished, hunted and helped at his family owned resort. He graduated in 1979 from St. Louis University. From there, he went on to work at Eastern Airlines. Jerry made his first knife in 1982 and he still has the knife today. He made knives part-time until 1985 and then stopped to concentrate on his family. 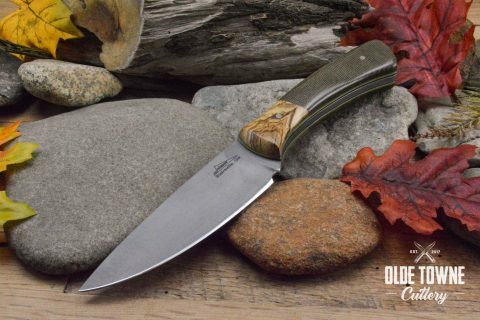 He began making knives again as he reached retirement from being the Plant Operations Manager at a large hospital in Miami. In June of 2018 Jerry moved to Blairsville, Georgia. This is when he began making knives full time. He enjoys the mountain life and being able to focus on knife-making. When we asked Jerry how he came up with his brand name it was too interesting not to share. He and his buddies were fans of the Allman Bros band in the 70’s. There was a drummer whose nickname was Jaimoe. Jerry used to ride in the back of his buddies car and play air drums. So, he was nicknamed Jaimoe. If you turn his logo upside down it looks like a knife. 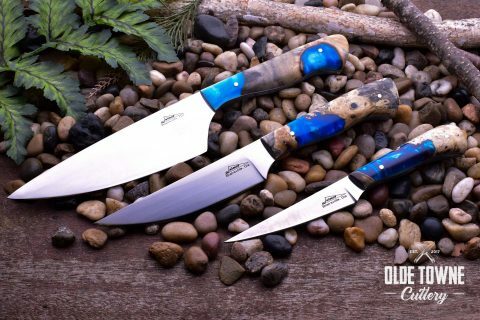 Jerry typically uses CPM154, D2, A2 and 1084 steel in making his knives. 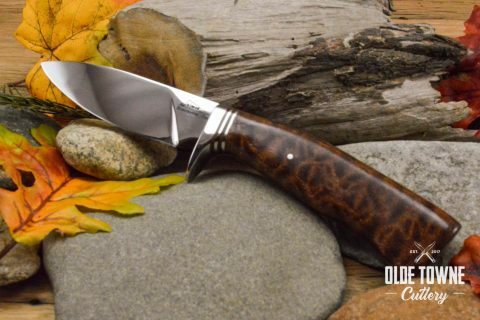 He offers several hunter patterns, as well as a filet knife, and kitchen knives. We are proud to represent Jerry of Jaimoe Knives. Green canvas micarta handle and an olive wood bolster. The knife has a 1/8″ CPM-154 bead blasted blade that measures 4 3/4″, and 8 3/4″ OAL. 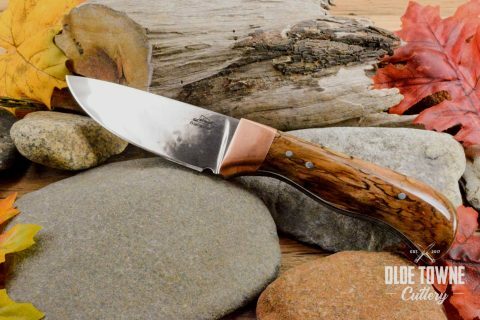 The knife has a stainless guard, a mirror polished blade, and a phenomenal handle made in Pomelle Sapele. The knife measures 9″ OAL with a 4″, 1/8 thick drop point blade.